Work alongside a distinguished group of researchers in Gene Expression, RNA Processing, DNA replication, Genomics, Gene Therapy, Molecular Basis of Disease, and the Mechanisms of Viral and Bacterial Pathogenesis in UF’s Academic Research Building. The Department of Molecular Genetics & Microbiology plays a central role in several interdisciplinary research programs in the Health Science Center. Affiliated centers include the UF Genetics Institute, the Powell Gene Therapy Center, the Center for Mammalian Genetics and the University of Florida Brain Institute. 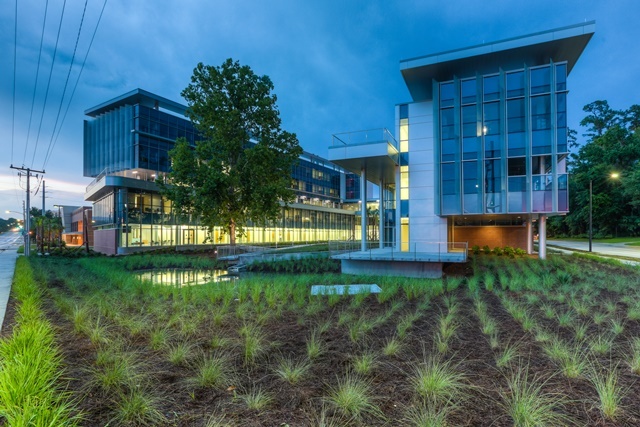 The $90.5 million, 163,000-square-foot building houses researchers from the colleges of Medicine, Engineering, and Public Health and Health Professions, creating the potential for new collaborations. Laboratories have an “open” design in which teams are not cut off from each other by walls. A new home for research that will speed scientific discoveries to patients, the $45 million, 120,000-square-foot complex will spark collaboration and spur medical advances by bringing together research teams from a range of scientific disciplines. UF–through its Health Science Center, College of Medicine and its teaching hospital, Shands at UF, made a strategic decision to create a unique campus-wide program to harness and enhance the multidisciplinary research, clinical care and educational skills of the entire university and thus maximize our ability to confront the awesome challenges brought on by nervous system disorders. On October 22, 1998 the University of Florida officially opened the doors to its world-class, UF Brain Institute building. 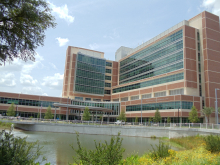 In 2000, the building was renamed the Mcknight Brain Institute. UF’s Nanoscience Institute for Medical and Engineering Technology (NIMET), an umbrella organization that coordinates nanoscale science and nanotechnology research and educational activities, completed the Nanoscale Research Facility (NRF), a 55,000 square foot building that centralizes nanoscience research throughout campus. The department occupies four of new laboratories and several offices in the NRF, located within a stone’s throw of the Health Science Center. 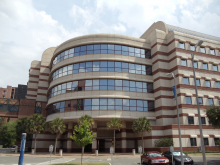 The UFHealth Cancer Center holds more than 250 researchers and clinicians at the University of Florida and Shands HealthCare who conduct research for the prevention, early diagnosis and treatment of cancer. The center’s collaborative research model encourages the translation of basic laboratory findings to novel curative and preventive therapies.